Mt. 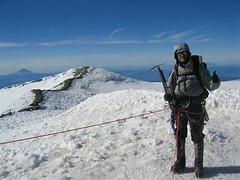 Rainier - A Blissful Climb!! Posted On Tue, 08 Aug 2006 01:23:00 +0000. Filed in mountaineering. By Vaibhav Bhandari. Vaibhav at Mt. Rainier Summit Originally uploaded by vbha. We started the climb on Saturday Aug 5, 2006 at about 9:30am from the Paradise parking lot. We was team of 12 lead by Olympia mountaineer Barney. Going at an easy pace we reach camp Muir at 2:00pm. The weather was awesome and blissful vista. I tented up with Robert. We had our dinner at 5:30pm. I really enjoyed the Mountain house Pasta i bought for dinner! We were planning to start the summit day at 11:30pm, it was going be a one long day from base camp to summit and back to cars! So after cranking up tonne of water from ice got to bed at 6:30pm. Barney woke us all by 11:00pm the same evening and after roping up we left for destination 14411ft. We had about 4500ft of elevation to cover and the plan was to do 500ft per hour and call if a day if we dont summit by 10am. With tonnes of folks attempting the summit and the RMI light lamp crew we slowed a bunch. At Ingram flats Michael a little fatigued, called it a day and decided to stay. From 4 ropes team and 12 member crew we went down to 3 roped teams with 11 people. For another 3 and half hours we travelled the nasty and steep rock route to get on top of dissapointment cleaver. It was 5:30am and our team was ready to launch from the cleaver! However we doing a very slow pace and with this rhythm we could never make the summit before 10am, however every was feeling quite strong! Barney with Garette and Robert made a call to take back Coleen and have the rest of crew give a shot to the summit!! Garette from assiting Barney become the climb lead. At 5:30am we just took of for the summit, Garette really pulled hard and I kept up with him while the other rope teams (Robert and Peter) were hauling their asses behind us as well. After about an hour of climbing I asked Garetter to slow down a bit so that i can keep up - man he was just running!! We had to take a de-route from the standard path as lot of crevasses had opened up. After solid hour and half of climbing we were at 13400ft and there we saw the hope of summitting!!! We kept up the pace and at 8:30am we were at the lip of the crater, booyaa!!! We all then shot for the true summit at the other side of crater. Very strangely the whole journey seemed to have a very satisfying resemblance to life, I enjoyed each moment of it but never was really crazy about a great end, but you know if you play it well you do succeed!! Soo.. we took a log of summit pics, signed the log, eat, drank, relaxed, Jeff and Larry even sh*?ed :) at 10am we headed back to the base camp!!! From Summit to Cleaver to Ingram flats to Camp Muir we were back !! The down climbing had really killed me, my inned thigh muscles and calves are still sore!!!! We got at the base camp at 3, Barney had graciously melt us some water. I immediately guled a bit and stared packing for way down!!! We left Camp Muir at 4pm and reached cars at about 7:00pm, I was really taking it slow and for last mile i almost baby stepped! Robert and Garette hung out with me all the while testing out all the possible trail benches!!!! From Saturday 9:00am to Sunday 7:00pm the whole journey was blissful!!! I’m really glad to have done this and lucky to have a great team and amazing weather!! I did the climb to fund raise for a non-profit clinic for the needy in my home area, Nashik. In case you are interested to help out to help this clinic get started please give me your donation checks. This effort is not under any US-NGOs but I’m trying to get this running myself – with local help and charities. Will let donors know about the progress of project as it un-rolls.